Patriarch Bartholomew: "I have no fear, no concern"
Ecumenical Patriarch Bartholomew made the following comments after being informed of the arrest of a suspect who planned his assassination. "I have no concern, no fear," said the Ecumenical Patriarch on Saturday when he visited the Church of Saint John in Adrianople. "I believe that God helps us, and employees of the state guard us well. I am not afraid, I have no concern. That's why I came here. I go everywhere. I do not change my schedule. 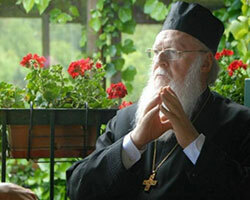 Glory to God, I'm in safe hands," said the Patriarch. Turkish authorities are looking for two suspects and continue to interrogate Serdar A., who has so far denied that he planned to assassinate the Ecumenical Patriarch on May 29th, which is the 560th anniversary of the Fall of Constantinople. Ecumenical Orthodox Patriarch Bartholomew I, commenting on a recently uncovered alleged plot to assassinate him, has said that he is not concerned over assassination claims as he believes God and his state will protect him. The Ankara Chief Public Prosecutor's Office launched an investigation into an alleged plot to assassinate Patriarch Bartholomew on the 560th anniversary of the conquest of İstanbul by the Ottomans. The probe was launched on an anonymous letter sent to the Kayseri Chief Public Prosecutor's Office that informed officials about the plot. According to the letter, Serdar A., who was later detained by police, and two other suspects, who have yet to be identified, were planning to assassinate Bartholomew on May 29, the anniversary of İstanbul's conquest. The letter said the suspect traveled to İstanbul between April 15 and 20 as part of their plan. He later returned to Kayseri to inform his two friends about the details of the plot to assassinate the patriarch. The police detained Serdar A. in the Melikgazi district of Kayseri as part of the investigation and are reportedly searching for the two other suspects. During a police interrogation, the suspect denied accusations that he was planning to kill the patriarch. He said he visited his relatives during his İstanbul visit and looked for a job there. “I do not even know where Bartholomew lives. I do not know what his title or job is. I just saw him in the media. I have no plans or intentions to kill him,” he reportedly told the police. Police officers later sent the suspect to the Kayseri Courthouse to be interrogated by prosecutors. Serdar A. was arrested and sent to jail pending trial after the prosecutor's questioning. Police sources said the suspect has been detained six times before for being involved in various crimes, including issuing threats and racketeering. This is the second time Turkish authorities have discovered a plot to assassinate Bartholomew.